I was travelling by car to this game as the person who was taking me was in a meeting so we set off later than we normally would. Because of this we had a pre-booked parking spot and a big thank you to David Hill for sorting this out for us which is greatly appreciated. As it was we arrived in plenty of time for kick off despite some queuing before joining the M61 and the parking spot was a 15 minute walk from the ground. 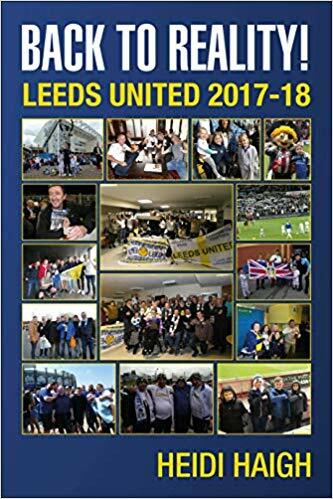 There were plenty of Leeds fans walking up to the ground at the same time as us which was unsurprising as we had another away ticket sell out. The good thing that after the game I was home in Halifax by 11.15 pm which was brilliant! I went to put my flag up behind the goal and was surprised to see that Preston had made some changes to the layout of the stand since we’d last been there. The first rows of seats were all fenced off so no fans could get to the pitch side. At least I had a prime spot for my flag. The team: Casilla, Ayling, Cooper, Jansson, Alioski, Hernandez, Bamford, Roberts, Harrison, Klich and Phillips. Subs: Berardi for Harrison (77), Forshaw for Roberts (83) and Roofe for Bamford (90). Leeds won the game 2-0 with a brace for Bamford (62 and 76). Attendance was 18,109 with 5,516 Leeds fans (plus however many were in their ends and the corporate areas! It was no surprise to see that Bielsa had kept the same team who started at Birmingham. Despite the defeat there, unless there are any injuries he likes to make few changes. Plus I think he also likes to give the players a chance to make amends especially after a defeat. Leeds were up to it from the start and looked a different side to Saturday despite the same team. Our first attack brought a save out of their goalie. We continued to attack and although came close we didn’t get anything on target. Alioski was down for a while and when I saw him continue with a bandaged head I couldn’t remember if he’d had one on when he came out or if that is what had happened to him. The officials were all guilty of ignoring what should have been free kicks to us but giving Preston plenty. When they were pulling Jansson’s shirt with the linesman to the left a few feet away and in full view of him, well he might as well have been on a different planet! More shirt pulling had one fan shouting, “if you want a Leeds shirt then go and buy your own!” The linesman on the right called an offside which had everyone around me baffled and screaming that he didn’t know what he was doing. Every time Bamford was fouled the ref gave it the other way saying he was backing in, with one incident late in the game where he was thrown to the ground given to Preston, unbelievable! We didn’t have everything our own way which I always say is down to the free kicks given to the opposition and Preston always looked like they could score. We had lots of possession again but not many clear cut chances. The one thing I would like to see again is us peppering the opposition’s goalie with shots. My memories of the great Don Revie side are of us hitting the woodwork but also making goalies work by making saves or more importantly letting us score goals. Having shots on target and taking more shots from outside the area would catch goalies unaware in my opinion. At half time I went downstairs where things were getting a little lively. A few women came into the toilets for a smoke as they’d been instructed to do so by the stewards despite there being no smoking signs everywhere. No one was allowed out of the ground to smoke so some even did that in the concourse. It didn’t make sense to me as the gates are opened at half time at many grounds. Now if it was Ipswich away on the last day of the season I could understand them not wanting to open the doors at half time as there’d be an invasion of fans without tickets! As the second half got ready to kick off their number four was having a word with the ref. I said he’ll be asking him to be nice to Preston. As it was, the same player brought Bamford down when he was clean through and given his marching orders within five minutes of the restart. Phillips came close with the free kick. From then on we kept the pressure on with having an extra man and at this time I felt we could get something from the game. The goalie looked jittery at times and so he should with thousands of Leeds fans breathing down his neck. With one shot he spilled the ball but recovered enough to catch it at the second attempt. When Bamford’s shot was saved by the goalie he looked like he’d a point to prove. Well he certainly did not long after that when he struck a fantastic goal from the edge of the area to send the Leeds fans behind the goal wild. I got hit on the head as the people behind me fell after being pushed from further up the stand. It didn’t matter though because Leeds were in front which was all that mattered. The next thing I saw Leeds fans being escorted out of the stand to our left with drinks being thrown at them plus there were loads of Leeds fans in the stand to our right too. We couldn’t settle for a one goal lead and had to go for another. Ayling came close to scoring and hit the post before Bamford got his second of the game with a header as Klich pinpointed the cross in the right place for him to score. I’d written in my blog on Saturday after the Birmingham game that on a different day Bamford could have had a hat trick. I was happy for him to get one today on that basis but although he came close we had to settle for two instead. The win sees us go back into second place as Sheffield Utd play tomorrow at Birmingham. Having seen someone post that we are definitely in the play offs now, that’s fine but I want automatic promotion please. As I kept saying what will be, will be, I was told we don’t want to go to Wembley and I quite agree. We have a late kick off of 5.30 pm this coming Saturday with the Sheffield Wednesday game at Elland Road. Having seen some of the Welsh lads after the game who’d said “can we do it?” My answer was that I daren’t make any predictions as I don’t want to jeopardise anything. What we do have is a chance and I would love for us to make things mathematically certain sooner rather than later for that automatic spot. We will know soon enough so see you on Saturday – LUFC – Marching on Together.